Pin It Lavender reminds me of Provence. I used to see postcards of beautiful lavender fields, the envelope in a matching purple colour, I always thought to myself, wouldn't it be great to visit those places.... Ironically when I went to France and had a chance to visit Provence it wasn't lavender season.Nor sunflower season either (another one of my favourites). But that didn't stop me from falling in love with the area, its small villages and towns, patios filled with happy people sipping glasses of (French) wine, dogs sleeping under the tables, bicycles parked along the side walks... Yes, it is a really great place. But so is Washington State, in it's own way. 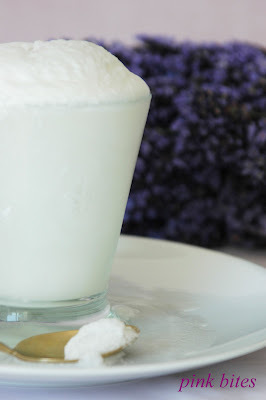 This lavender float is made with two wonderful local products from the Seattle Area. It's one of my favourite treats during the summer. Place one scoop of ice cream in a cold tall glass. 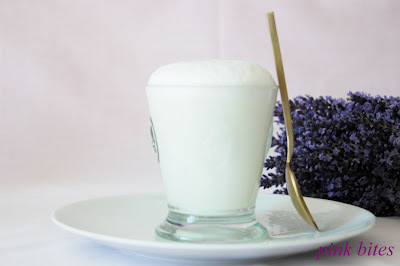 Top it with the lavender soda slowly, as it will foam up. Repeat with another glass. Close you eyes and dream of purple lavender fields! 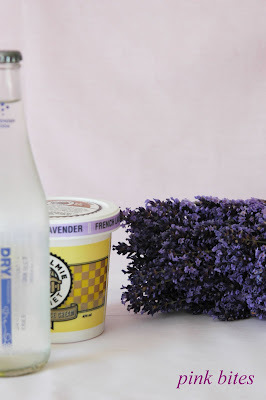 eu nao consigo encontrar lavanda aqui. com certeza deve ter mas ainda nao nos encontramos. quando vi esses galhinhos no teu post nao resisti.